Company Overview - Dongguan Sempur Electronic Technology Co., Ltd.
11YRSDongguan Sempur Electronic Technology Co., Ltd.
Dongguan City E-Tone Electronic Products Factory and Dongguan Sempur Elecrtronic Technology Co.Ltd are the brother companies. 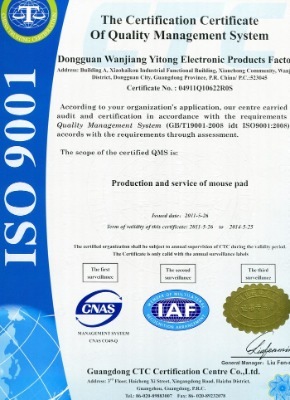 E-tone is a professional and experienced manufacturer of various kinds of PU products,It has been established in 2004, such as mouse pads, keyboard pads, wrist supporters, laptop sleeves, computer surrounding products, insoles, car seat cushions and relative human body hygienical products. And Sempur is a trading company, we sell all the products of E-tone. we has our own exporting & impoorting right.We are equipped with several relative production lines and we also have our owned engineering developing department which takes the responsibility of developing and upgrading products. Under the completed management system, each product we export is strict in quality control. That is why we enjoy a good reputation among our overseas customers. We have established long-term relationships with our satisfied customers from North America, Europe, South Africa, East Asia and Oceania.Our promise is "superior quality, competitive price, fast delivery and sincere service". We accept OEM orders based on customers' requirements. Our products are not only durable and elegant but also good for health and comfort. We hope to establish business relationship with you in the future. If you have any questions about our products, please do not hesitate to contact us.